125+ Delicious Recipes to Flatten Your Belly, Turn Off Your Fat Genes, and Help Keep You Lean for Life! Enjoy great food the Zero Belly way and lose up to sixteen pounds in fourteen days! From David Zinczenko, author of the Eat This, Not That! 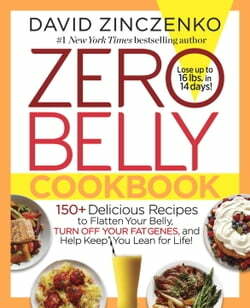 series, Zero Belly Cookbook taps the groundbreaking science and nutritional power of the New York Times bestseller Zero Belly Diet to build more than 125... read more delicious meals, drinks, snacks, and desserts, each perfectly balanced to help blast belly fat, turn off your fat genes, and keep you lean for life.